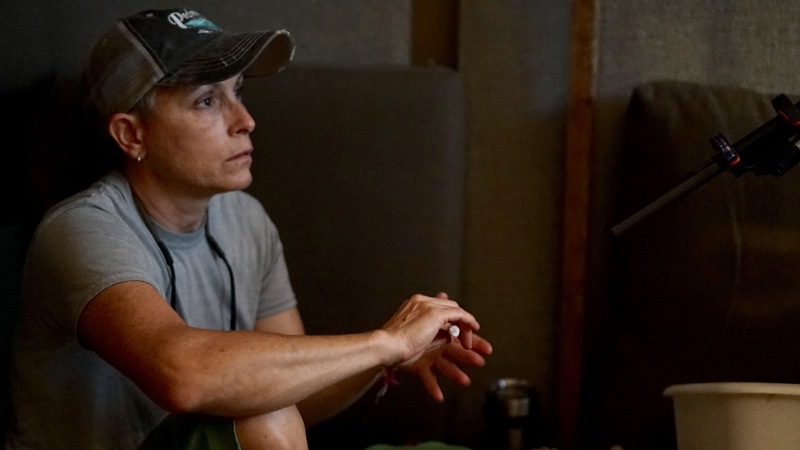 Susan Fitz-Simon (Boyhood / Last Flag Flying) is a veteran foley artist with over 20 years of experience in the industry. Susan is currently the lead foley artist at Soundcrafter, a post-production audio facility based in Austin, Texas. Soundcrafter recently opened a state-of-the-art post-production facility, including a foley stage and prop room. ­We caught up with Susan to find out how she became a foley artist as well as talked to her mentor, renowned foley artist, John Roesch (Black Panther / Avengers: Infinity War). Susan getting ready for a day of recording footsteps at Soundcrafter. Korey Pereira: Susan, how did you get into foley? 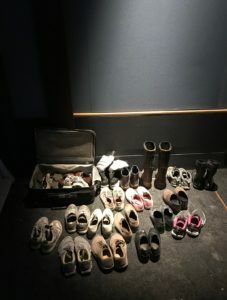 Susan Fitz-Simon: Someone had introduced me to the art of foley back in 1994 and I immediately knew that was the job for me. I have a background in both music and dance, which both helped a lot when getting into foley. I’ve also had a recording studio since the early 90s, so having an understanding of the technical aspect of it was really helpful as well.At the time, a friend of mine was a supervising sound editor at Warner Brothers and I asked him if it was possible to connect me with anybody. He said he could give me some names of people doing foley in town, but he couldn’t get me a job. [With foley] you either have it or you don’t. I wanted to try to make it, so I reached out to a handful of people. For two years, probably once a month I would call and ask if I could come to the foley stage and just watch, mark off the cue sheets or pull props. Every now and then they would say yes, so I would go do that whenever I could. I would also practice at home. I would set up a little piece of wood on my floor, turn on a tv show on the television, and turn the volume off and just walk [the footsteps] of every single person that went across the screen. That was very, very helpful. When I finally got a foley gig, I felt I was already ahead of the game. KP: So what kind of foley work did you do while in LA? SFS: I landed my first gig at the Warner Brothers Burbank lot. That was one of the stages I would go to and sit and watch. While doing foley there, I was able to learn from some of the greatest foley artists in the business and that is really how I got into foley. There I worked on a lot of television shows that were popular in the 90s like Friends, That 70s Show, Drew Carey, Mad TV. I also worked on a lot of reality tv – The Apprentice, Fear Factor, Survivor. TV was a great place to start. There was lots of work and you can really hone in your skills and your craft as an artist. So that is where I got my start. Eventually I decided to venture out from Warner Brothers and worked more on films doing B-Films and made for tv movies. I also kept doing TV work as well. They are both fun work. KP: On the topic of mentorship, did you have any mentors when you were first getting into foley? SFS: As for mentors, I didn’t have one specifically when I first started. That being said, everyone at WB welcomed me with open arms. I started at the Burbank facility in 1997 and then started working over at the Hollywood facility as well in ‘98. It was there that I met John Roesch, who I would consider my mentor. I was working night shifts at the time so I would sometimes get there early and just sit and watch. Sometimes John would bring me onto the stage and show me some tricks and give me great ideas and great tips. I am thankful and grateful for that time that he would take. He just made me feel really welcome and it is not easy to get into foley, so it was amazing to have someone so welcoming. Really all the staff at Hollywood and Burbank were very, very warm and willing to let me just hang out and watch and I’m forever grateful and thankful for that. KP: John, thank you for joining the conversation. How did you and Susan meet? John Roesch: I met Susan when I was working at the Foley Stage at Warner Hollywood. She was working the night shift. I would see her and her then-partner during the shift change and we would chat from time to time. She had great energy and would ask really intelligent questions about the craft of foley. I am not sure how much of a mentor I have been to her as much as a cheerleader for her to take chances and grow in our discipline. This is the way you get better and become a great foley artist. KP: So John, how did you get into foley? JR: I was an actor at Radnor High School and attended the United States International University School for Performing Arts in San Diego for one year. During that time I along with 3 other peers, made a short film called “Indian Magic is What You See.” This won the San Diego Film Festival in 1972. Spring-boarding from there, I attended New York University and graduated with a BFA in Film. I then applied and was accepted to the American Film Institute as a Directing Fellow. As fate would have it, a fellow filmmaker asked me if I could “help” with the sound on the film she was working on and that was my first taste of foley. I just was in the right place at the right time. KP: John and Susan, what do you think makes a great foley artist? JR: The art of foley is not a job but a collaboration with my foley partner, Shelley Roden and my foley mixer, Scott Curtis. This team effort is my favorite part and brings out the best in each of us. 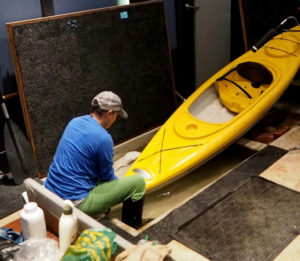 As to what makes a great foley artist is the intangibles to allow someone to “act” in a way that the sounds being created, either footsteps or props, are seamlessly woven into the storyline and in such a way that you don’t realize they are sound effects performed after the fact. SFS: I second everything John says. I would have to say that generally if you have a musical background or a dance background those two things can certainly help with making you a better foley artist. Also, you have to be very dedicated and very committed to the craft because I’ve been doing this for 20 plus years and I can always be better. You have to know that and be ok that you are always going to be learning and you can always be better at what you do. That is my take at least. KP: Susan, what made you decide to move to Austin? SFS: I didn’t feel the need to grow old in LA and spend so much time sitting in my car getting to and fro, haha. I came through Austin with a band I was touring with in 1995/96 just before I started doing foley at Warner Brothers and I absolutely fell in love with the town. All though I grew up in Rhode Island, I have wanted to be a Texan since I was a kid. Basically I just got here as fast as I could. I met my partner, Kelli, in ‘05 in LA and she was from Austin. By ‘07 we had packed things up and I told myself I am going to build myself a foley stage there, and do foley and make it happen. And it was a dream that came true. So yeah, I got to Texas as fast as I could. 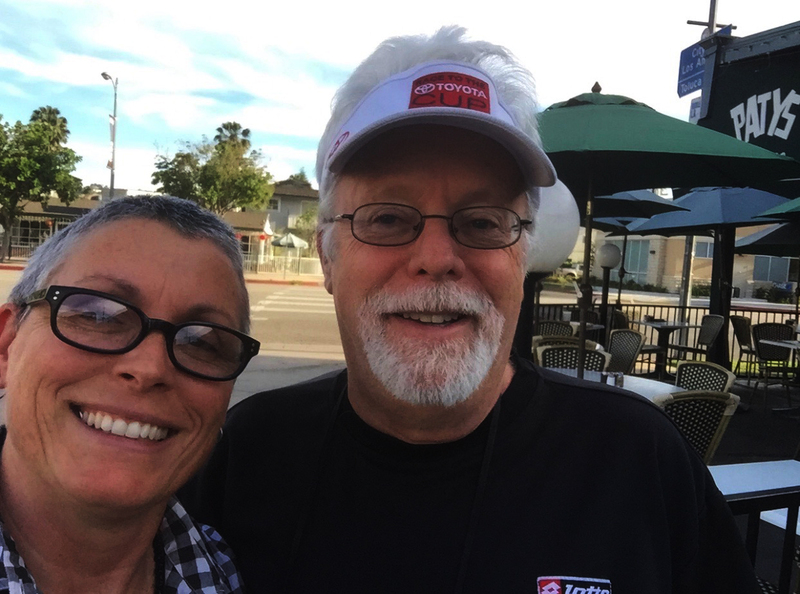 Susan Fitz-Simon and John Roesch catching up during Susan’s recent trip to California. KP: Have you two stayed in touch over the years? SFS: For sure. Anytime I would go back to visit and/or to work in LA, I would always give him a jingle and either swing by the stage or grab some lunch. JR: Recently she even came to visit my home in San Rafael, California. She also visited the Ranch where I work. I hope to visit her Stage in Austin! SFS: So yes, we have stayed in touch and I would consider him a dear friend. KP: Susan, can you tell us about the kind of foley work you have been doing since moving to Austin? SFS: Since I have been in Austin, I have primarily worked in film. I’ve worked on Richard Linklater’s last six films and a lot of smaller films. I also cue and edit my own foley as well as edit dialogue, so I tend to be able to stay pretty busy. KP: Can you tell us about the new foley stage you are working at in Austin? Foley Artist Susan Fitz-Simon recording waves in the water pit at Soundcrafter. SFS: Tom Hammond, the owner of Soundcrafter, and I have built a brand new foley stage, which is sounding incredible. We’ve gone around and tweaked it and found all the sweet spots, which you have to do when you build a new stage. On the last film we worked on, I really got to see the full scope of the sound of the stage and I’m extremely pleased with the outcome. It is a truly amazing, state-of-the-art foley stage. A lot of love, sweat and tears have gone into this facility. All of the guys I work with have all put time in – from wiring to the other nitty gritty details of making this new facility happen – it is really quite amazing. KP: Do either of you have any advice for aspiring foley artists? JR: I would say he or she needs to use the three greatest assets we have. Namely our two ears and our brain to “figure out” how to create what we see on the screen so when we play it back we agree it sounds right. AND a shameless plug for my daughters podcast, The Right Scuff, where we interview current and retired foley artists, mixers and other sound professionals that speak to this very question. 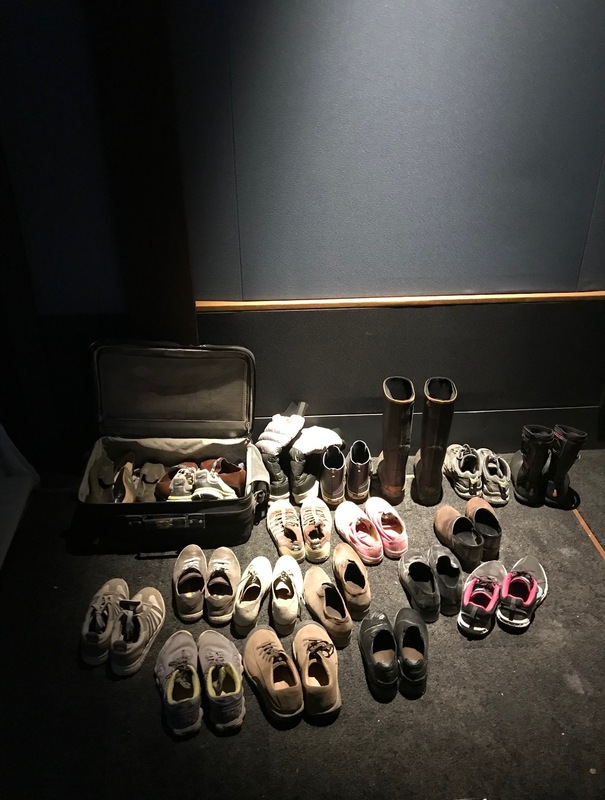 SFS: My advice to anyone who is wanting to become a foley artist is be persistent and practice at home, because you are not going to have time to practice on foley stages because there aren’t that many you can just walk into and practice on. Just sit at home, turn your tv on and just walk footsteps and practice whenever you can. That I would say is the most important thing. And you have to be passionate about it. Be persistent. If you want it bad enough, you can make it happen. Make connections with the people who are in the industry. See if you can get someone to mentor you or at least someone who is willing to let you sit on the stage and watch them. Foley is a great craft and I can’t imagine my life without it.